Last year, just about this time, Food52 shared a recipe for a gluten-free chocolate cake, dubbing it “Genius Chocolate Quinoa Cake” to fit into the site’s “genius” recipe file. The online food aggregator’s video of baking the cake is a therapeutic two-minute play-by play of the simple preparation and a celebration of that most surprising ingredient—quinoa—in place of flour or other stabilizers. 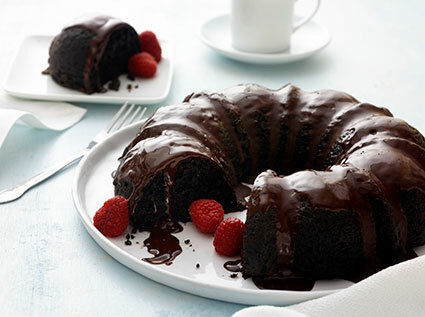 The final result is a Bundt cake with a perfectly moist crumb topped by an indulgently thick chocolate glaze. The chef responsible for the “genius” creation? None other than Paula Shoyer, known widely as The Kosher Baker and who can be found on Facebook and Instagram using that handle. The recipe had been taken from her book The Healthy Jewish Kitchen , which debuted in November 2017. If you’re stumped for Passover dessert ideas, you can always turn to Shoyer. 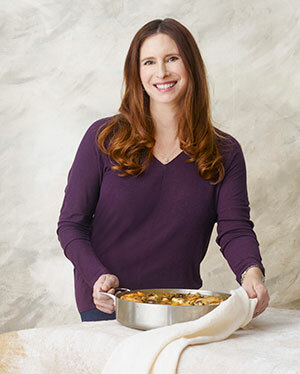 The Jewish food personality and cookbook author—known for her culinary curiosity and signature babkas—has penned recipe collections that include The New Passover Menu (2015) and The Holiday Kosher Baker (2013). Like many other chefs, she draws inspiration from her travels, everyday food encounters and even internet gossip of the foodie persuasion. Shoyer, who avoids matzah meal unless baking for those with nut allergies, has helped bring Passover desserts into the era of you can enjoy this all year round! Without subtle eye rolls and silent, yeah, rights. In place of matzah meal, which tends to lend that “Passover taste” to baked goods, Shoyer suggests combining finely ground nut flours with a Passover friendly starch, such as potato starch or tapioca flour. For the oftentimes gluten-free holiday, she finds that fruit-based and chocolate desserts tend to work best with this formula—as does planning ahead. But adjusting old standbys to a new flavor profile can be just as successful. Shoyer has recently done this, presenting her fans with a new lemon version of the viral chocolate quinoa cake for the 2019 holiday. Find it below along with the tried-and-true original. Now, thanks to Shoyer, you can have two gluten-free recipes under your belt to break out at any time of the year, sans eye rolls. Place the quinoa and water into a small saucepan and bring it to a boil over medium heat. Reduce the heat to low, cover the saucepan and cook the quinoa for 15 minutes, or until all the liquid has been absorbed. Set the pan aside. The quinoa may be made 1 day in advance. Preheat the oven to 350°. Use cooking spray to grease a 12-cup Bundt pan. Sprinkle the potato starch over the greased pan and then shake the pan to remove any excess starch. To make the glaze, melt the chocolate in a large microwave-safe bowl in the microwave or over a double boiler. Add the oil and vanilla and whisk well. Let the glaze sit for 5 minutes and then whisk it again. Use a silicone spatula to spread the glaze all over the cake. Place the quinoa and water into a small saucepan and bring it to a boil over medium heat. Reduce the heat to low, cover the saucepan, and cook the quinoa for 15 to 18 minutes, or until all the liquid has been absorbed. Let sit for 5 minutes off the stovetop. The quinoa may be made 2 days in advance and stored in the fridge. Preheat the oven to 350°. 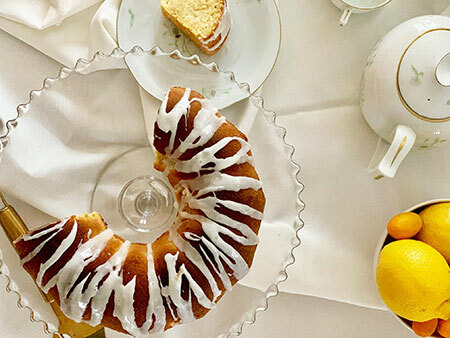 Use cooking spray or oil to grease a 12-cup Bundt pan. Sprinkle 1 to 2 tablespoons coconut flour, or more if needed, over the entire greased pan and then shake the pan all around to cover and then tap out the excess. Place the quinoa in the bowl of a food processor. Add the lemon zest and juice, eggs, vanilla, oil, sugar, almond flour, coconut flour, baking powder, baking soda and salt and process until the mixture is very smooth, about 2 minutes. Pour the batter into the prepared Bundt pan and bake it for 1 hour, or longer, until a skewer inserted into the cake comes out clean. Let the cake cool for 30 minutes and then remove it gently from the pan onto a wire cooling rack. To make the glaze, place the confectioners’ sugar into a bowl and add 1 tablespoon of lemon juice and whisk well. Add more juice, a teaspoon at a time, until you have a thick glaze. Drizzle or pour over the cake. Which replacement for egg would you use to make this recipe vegan? Curious about the chia egg substitute: does one tablespoon chia to three tablespoons water equal one egg or the four eggs for the recipe? Thank you! I’m curious why the cooking instructions for quinoa in the two cakes are different. Does the texture need to be different when using almond flour vs cocoa and pototo starch? Thanks! Quinoa usually steams off the heat for a few minutes after cooking. I think the second recipe is just more detailed, “set aside,” vs “let sit for 5 minutes.” They are essentially the same;you are letting the quinoa absorb the water. Can one substitute olive oil for coconut oil for both cakes especially the lemon one? Yes, you can substitute other oils. My friend tested that recently with grape seed oil and she says it was just as good. Is there any nutritional/caloric value information about this? Since when are baking soda and baking powder k8sher for passover use? There are kosher for Passover baking powders and baking sodas available online and in many stores. Check amazon.com for some examples. There is a kosher for Passover baking powder. Responding to Adria. Instead of using 1.1/2 cups sugar, I used 1 cup maple syrup. The cake tasted delicious to me, and baked up well. Instead of maple syrup, would you like to try using Cherries (fresh or frozen) ? Because Chocolate and Cherry go well together, too. Just remember to take the pits out first before blending with the batter. Or try a half cup maple syrup with a half cup cherries. Can you make this cake ahead and freeze it? Coconut oil has too much saturated fat, unfortunately. I would use a light vegetable oil like canola or grapeseed. I need a replacement for the coconut oil. Responding to Elizabeth. Instead of using coconut oil, I used Soybean oil, same amount. The cake did not pick up any ” soy” flavor at all.